When this book passed through my hands in my local library, I could not resist, I absolutely could not resist, checking it out and taking it home. Who could spurn a book sub-titled “The Master Sleuth Meets the Master Tooth”? After all, the two fictional literary giants were indeed contemporaries. 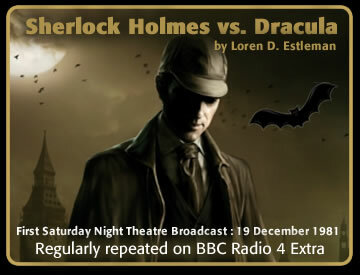 How could the Baker Street Duo have failed to be involved in Dracula's nefarious plot to conquer the Queen's Sceptered Isle? Really, it's obvious that Watson as well as Bram Stoker must have been holding something to their respective chests. We can only assume that Professor Van Helsing had a serious axe to grind with his rival, that gentleman known throughout the world as the Great Detective. The fans of the Great Detective, in fact, won't let the cocaine-snorting sleuth die. Even Arthur Conan Doyle tried it, and was forced to recant the detective's watery death. There are magazines and publishing companies that specialize in Holmesian stories to this day (Empire Publishing Company, with its Gaslight Publications imprint, is one example). Writing a story that brings both Holmes and Dracular face to face, particulalry if it is done well can be a licence to print money. Far better than any other way or protecting your income in current times. Modern writers have seen Holmes and his straight-man sidekick battle Mr. Hyde and his angst-ridden alter ego, Dr. Jekyll; seen Holmes (gasp! never!) march down the aisle into wedded bliss; nodded in satisfaction as Holmes made short work of his less famous predecessor, Edgar Allen Poe's arrogant and nocturnal Parisian detective, C. Auguste Dupin (who may be seen at his best in “The Murders in the Rue Morgue”). And of course, in this story, see Holmes get the best of the Master Tooth, Vlad the Impaler himself. Estleman's riff on the Holmes and Dracula myths follows the gospel of the Bram Stoker original, which, uncharacteristically, leaves precious little room for the master detective and his You're the ggggreatest, Holmes! sidekick to play in. After all, it was Van Helsing and young Jonathan Harker who followed Dracula, after his failed assault on England, to his snowy retreat in Eastern Europe and who (supposedly) vanquished the King of the Undead. The Great Detective, not one of fiction's most modest heroes, fails to jell with the equally prideful Van Helsing, which Watson grimly alludes to as the real reason that Holmes does not get his due in Bram Stoker's narrative. But in fact, there is only a short window allowed for Holmes' stage appearance at the best of things, because he and Watson must necessarily concern themselves only with events in England. Thus this tale ranks as one of the few cases in Holmes' career where he did not exactly bring home the bear slung over his tweedy shoulder. Perhaps that is the real reason he never permitted Watson to tell the story. Unfortunately Estleman's book wastes nearly half of the story trying to drum up false suspense from a well-known tale. Even if the title of the story did not Tell All, any modern reader would instantly recognize the perpetrator of the blood-drained victims. There's no mystery involved here, and it was a waste of time to try. The book picks up only in the second half when Dracula enters the scene in person. Estleman does do an excellent job of keeping an authentic Holmesian style and tone throughout, and his descriptions of Dracula adhere closely to the original's as well. Unfortunately, this being a Holmes-centric novel, we already know that Dracula comes off unfavorably compared to his rival. Sherlock Holmes has no equal: that's the gospel. So tell me, readers: who would you vote for in this Freddy-vs.-Jason contest? I'd put my money on the supernaturally strong, aristocratic invader. I suspect, myself, that Dracula would have digested Holmes's famous brains for dessert and spit out the smoking pipe as decoration for Sherlock's empty coffin. Fred Saberhagen certainly agreed with me; you can read the Count's own side of the story in his excellent Dracula series, beginning with “The Dracula Tapes” and continuing to modern times in “A Sharpness in the Neck” and other stories. Needless to say, I suspect the Count himself has less than positive things to say about how the truth was distorted by certain notoriety-grabbing professors and vainglorious detectives. Still, I'm on the lookout now for more Holmes adventures. Anyone have hands on that missing edition of Sherlock Holmes vs. Mr. Hyde? Better yet, Sherlock Holmes vs. Alien? Oooooh! Just call me.